A few months ago my parents picked this up for me on a trip to the States. I used it fairly soon after getting my hands on it and frankly was unimpressed. 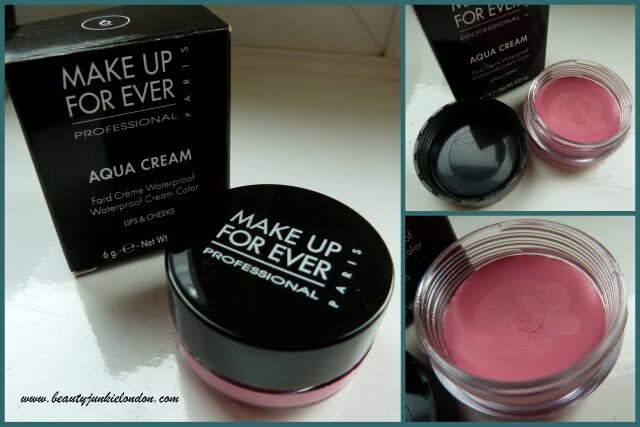 A bright pink, promising long lasting wear for cheeks and lips – I tried it on my lips and it looked rubbish. The waterproof texture of it meant that anywhere there was moisture on my lips it didn’t stick – so it basically clung to the dry bits and vanished on the others – as you can imagine, this was not pretty. But then a while later I decided to give it another go – shame for it to go to waste. Swatching it on the back of my hand I realised it isn’t just a bright pink – but a bright pink with a gorgeous gold shimmer that you can only really see when it’s blended out. In the pictures below you can see it best on the artificial light photo. So I tried it again on my cheeks and liked it far more. It’s slightly harder to get used to using – the colour is vivid, so you only need the tiniest amount to get a decent colour but when used right it can leave you with beautifully glowy cheeks with a hint of golden highlight. Lovely stuff. Plus this stuff wont budge. I’m now kicking myself for not kicking up one of the bronze eye shades when I was in NYC…! Loos great. Been wanting to try Make Up For Ever but not had the chance. Definitely on the wish list. I love the colour of this – reminds me of Bourjois Rose D’Or, one of my fave blushers. Did you know MUFE is now available at http://www.gurumakeupemporium.com ? Spotted someone tweeting about it the other day. I’ve never tried any of their products but have heard so many beauty bloggers rave about them I’d love to give them a go!